NEIL GAIMAN'S SANDMAN #26, "Season of Mists Chapter 5", Page #8. KELLY JONES Pencils and George Pratt Inks. 11" X 17.5" in very good condition. This is the original "one of a kind" art used to make the comic book. 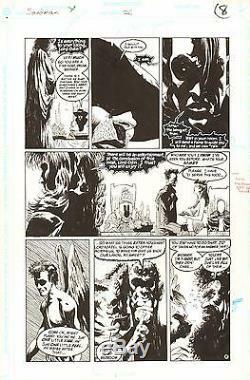 The item "NEIL GAIMAN & KELLY JONES SANDMAN #36 DC VERTIGO Original Comic Art 1991" is in sale since Tuesday, July 26, 2016. This item is in the category "Collectibles\Comics\Original Comic Art\Interior Pages". The seller is "make_mine_marvel_1973" and is located in New York, New York.